Khadija was one of history's most remarkable women. Prophet Muhammad (pbuh) once said that the four greatest women of mankind were: Khadija bint Khuwaylid, Fatima bint Muhammad (his youngest daughter,) Mary bint Emran (the Virgin Mary) and Asiya bint Muzahim (the wife of Pharaoh). Khadija continues to inspire people to this day who revere her for taking great care of the Prophet of Islam and for showing the world, through her behavior, what a pious, modest and courageous woman can accomplish. The example she left for mankind remains timeless. Today, April 24, commemorates the 100th anniversary of the Armenian Genocide carried out by the “Young Turk” government of the Ottoman Empire in 1915-1916. One to one-and-a-half million Armenians were killed during the Armenian Genocide -- through wholesale massacres and deportations consisting of forced marches -- out of two-and-a-half million Armenians in the Ottoman Empire. Over the past few years, I have commemorated the Armenian Genocide at Mich Café with testimonials by Armenian friends sharing what it means to them. I was about to do the same this year too when I fell across two illustrations that give hope and decided to share those instead. 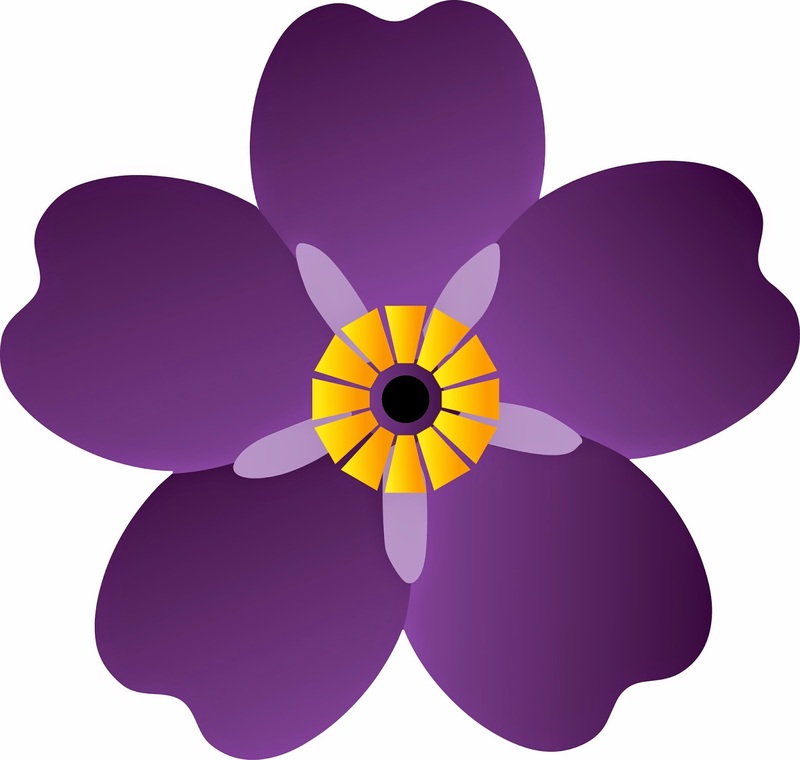 The first is the beautiful forget-me-not, the official emblem of the 100th Year of Remembrance of the Genocide issued by the Republic of Armenia. The second is an illustration by my friend cartoonist Sareen Akharjalian on her webcomic, Ink on the Side. The forget-me-not, illustrating the worldwide observance of the centennial, as explained by the Armenian Church, expresses the theme of eternal remembrance. It is also meant to symbolically evoke the past, present and future experiences of the Armenian people. The past: The black center represents the sufferings of 1915, and the dark aftermath of the Armenian Genocide. 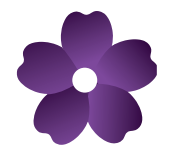 The present: The light purple petals represent the unity of Armenian communities across the world -- all of whom stand together in this 100th year of remembrance. The future: The five petals represent the five continents where survivors of the Armenian Genocide found a new home. The dark purple color is meant to recall the priestly vestments of the Armenian Church -- which has been, is, and will remain at the heart of the Armenian Christian identity. Eternity: The 12 trapezoids represent the twelve pillars of the Dzidzernagapert Armenian Genocide memorial in Yerevan, Armenia. Yellow represents light, creativity, and hope. Today, Armenians can be found in every corner of the globe, creating a Diaspora population of about three million. All over the world, they commemorate the tragedy on April 24, the day in 1915 when 250-300 Armenian leaders, writers, thinkers and professionals in Constantinople, present-day Istanbul, were rounded up, deported and killed. The Ottoman military then uprooted Armenians from their homes and forced them to march for hundreds of miles, depriving them of food and water, to the desert of what is now Syria. Since then, the pomegranate was adopted as a symbol for Armenians. The narrative is that during the 1915 Genocide and exodus, pomegranate was the only food mothers could find to feed their offspring. Those marching could also count the days with the pomegranate seeds. It is said that each fruit, however big or small, holds 365 seeds! The second illustration is by Sareen Akharjalian on her webcomic Ink on the Side, which is awaited online every Monday morning to brighten up the week. And yet, 100 years on, U.S. President Barack Obama, wary of damaging relations with Turkey amid growing unrest in the Middle East, won't use the centennial of the massacre to declare the brutal episode genocide. Despite his campaign promise in 2008 to "recognize the Armenian Genocide" as president, the White House on April 21 issued a carefully worded statement on a high-level administration meeting with Armenian groups that avoided using the term "genocide." An administration official said Obama, who will mark the centennial today, would similarly avoid using the word. "We know and respect that there are some who are hoping to hear different language this year," the official said. "We understand their perspective, even as we believe that the approach we have taken in previous years remains the right one -- both for acknowledging the past, and for our ability to work with regional partners to save lives in the present." "President Obama's surrender to Turkey represents a national disgrace. It is, very simply, a betrayal of truth, a betrayal of trust," said Ken Hachikian, the chairman of the Armenian National Committee of America. Even some of Obama's allies decried the decision. California Rep. Adam Schiff, the Democratic leader of the House Intelligence Committee, said he was "deeply disappointed" by the decision to avoid the word genocide. "How long must the victims and their families wait before our nation has the courage to confront Turkey with the truth about the murderous past of the Ottoman Empire?" Schiff wrote in a statement. "If not this President, who spoke so eloquently and passionately about recognition in the past, whom? If not after 100 years, when?" At a service in Rome on April 12, Pope Francis used "genocide" to describe what happened a century ago. In response, Turkish Foreign Minister Mevlüt Çavuşoğlu recalled the ambassador to the Holy See for "consultations." With so many hot points currently raging in the Middle East, each day creating more casualties and refugees and requiring ever more generosity from the coffers of the international community for humanitarian needs, what does the future hold for the Palestinians in the Occupied Territories? According to a report by the UN Office for the Coordination of Humanitarian Affairs (OCHA) titled “Fragmented Lives,” Palestinian civilians continue to be subject to threats to their life, physical safety and liberty. Last year witnessed the highest civilian death toll since 1967. 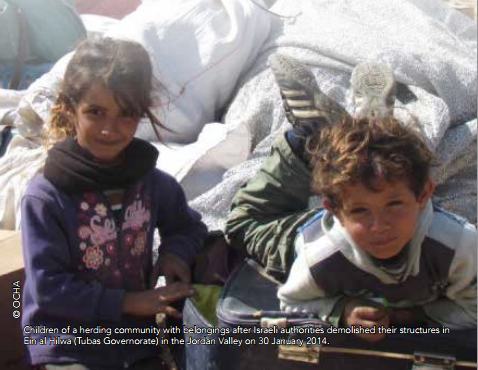 Humanitarian needs in the Occupied Palestinian Territories are driven by practices related to Israel’s prolonged occupation and recurrent escalations of armed conflict, OCHA says in its 2014 Annual Humanitarian Overview released on March 26. “2014 was a devastating year for Palestinians in the Occupied Palestinian Territories,” said James Rawley, Humanitarian Coordinator for the Occupied Palestinian Territories. In Gaza, 1.8 million people experienced an escalation of hostilities, which resulted in over 1,500 Palestinian civilian fatalities, including more than 550 children, and left some 100,000 residents without a home. On the Israeli side, five civilians, including a child, as well as a security guard were killed. Serious concerns were raised over the conduct of hostilities of both Israeli forces and armed Palestinian actors. 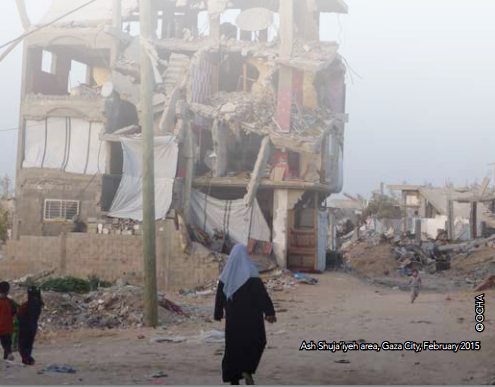 Reconstruction in Gaza has been slow, hampered by the continued blockade and the lack of funding, although the temporary Gaza Reconstruction Mechanism has enabled the import of construction material. According to the OCHA report, movement and access restrictions continued to fragment the occupied territory, undermining Palestinians’ livelihoods and impeding their access to basic services. The violence spiked during the second half of 2014, due to the 51-day Israeli offensive on Gaza between July 7 and August 26 -- the deadliest escalation in hostilities since the beginning of the Israeli occupation in 1967. Overall, some 4,000,000 Palestinians in the West Bank and the Gaza Strip remain under an Israeli military occupation that prevents them from exercising many of their basic human rights. This is the fourth year in which OCHA has detailed the key humanitarian concerns in the Occupied Palestinian Territories. The purpose of the report is to provide a comprehensive overview of the underlying causes or drivers of the humanitarian situation in the Occupied Palestinian Territories in a given year. The concerns outlined in the Humanitarian Overview reflect the advocacy priorities identified by the Humanitarian Country Team (HCT), the main humanitarian coordinating body for UN agencies and Non-Governmental Organizations (NGOs) in the Occupied Palestinian Territories. In 2014, these priorities remain: Accountability; Life, Liberty and Security; Forced Displacement; Movement and Access; and Humanitarian Space. The Overview is structured around these priorities, with the issue of accountability addressed throughout. Each section contains a calendar of the main developments in 2014 and a Way Forward, which details the main steps required to rectify policies and practices inconsistent with international law and reduce humanitarian vulnerability. As with all OCHA reports, the Humanitarian Overview is based on data collated and cross-checked from multiple sources that include OCHA, other UN agencies, international NGOs, Palestinian and Israeli NGOs and, where relevant, government sources. 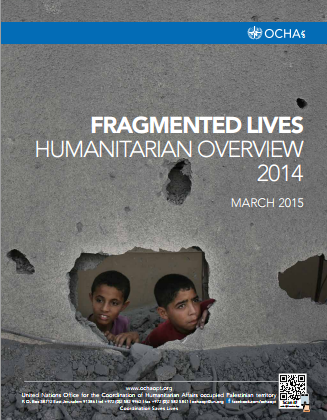 The overall situation described in the report is a protection-based crisis, with negative humanitarian ramifications. This crisis stems from the prolonged occupation and recurrent hostilities, alongside a system of policies that undermine the ability of Palestinians to live normal, self-sustaining lives and realize the full spectrum of their rights, including the right to self-determination. Were these factors removed, Palestinians would be able to develop their government institutions and economy without the need for humanitarian assistance. -- Israel, the occupying power, must fulfill its primary obligations to protect the Palestinian civilian population, and ensure that people’s basic needs and human rights are met. This would include taking action to secure the physical protection of Palestinian civilians, cease their displacement, ensure accountability for violence and abuse, and lift restrictions on the movement of people and goods, as well as on access to land and resources. -- All parties to the conflict, including armed groups, must fulfill their legal obligations to conduct hostilities in accordance with international law to ensure the protection of all civilians during hostilities and to ensure accountability for acts committed in contravention of the laws of armed conflict. 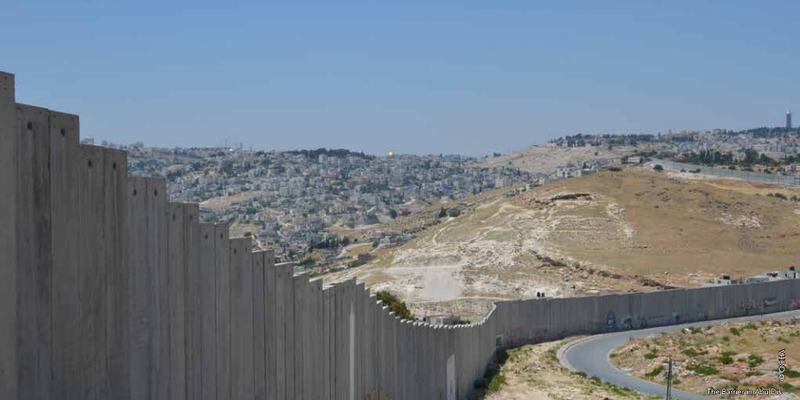 -- Third states share responsibility for ensuring respect for international humanitarian law in the Occupied Palestinian Territories and for promoting compliance with human rights obligations, and should take all necessary actions stemming from that responsibility. For every LED light bulb sold in IKEA stores between February and March 2015, the IKEA Foundation donated €1 (AED3.88) to UN refugee agency (UNHCR) to light refugee camps -- making them a safer, more suitable place for the many families who live there. Under its “Brighter Lives for Refugees” campaign, the IKEA Foundation drive in the global retailer's stores has so far this year raised €10.8 million (AED 42 million) that will improve the lives of refugees by providing educational opportunities and distributing renewable energy devices such as solar lights, UNHCR said in a statement on Friday (April 10). The funds will help improve the lives of 380,000 refugees in Bangladesh, Chad, Ethiopia and Jordan. "Thanks to IKEA's co-workers and customers, thousands of refugee children and families will now have access to sustainable energy and lighting," said Per Heggenes, CEO of the IKEA Foundation. "Simple activities like sharing a family meal, doing homework and important social gatherings will now be possible for some of the most vulnerable people on our planet." The campaign, which began in 2014, raised €7.7 million (AED30 million) last year. Already thousands of refugees have benefited. In Jordan, some 11,000 Syrian refugees living in Azraq camp can move around safely after 500 solar streetlights and LED streetlights were installed. In refugee camps around Dollo Ado in Ethiopia, 40,000 solar lanterns -- one per refugee family -- and 240 streetlights are being delivered. In Chad, over 13,000 refugee children have been enrolled in primary school. "The number of displaced people worldwide has, for the first time since World War II, exceeded 50 million people, including 13 million refugees who are under UNHCR's care," said UN Deputy High Commissioner for Refugees T. Alexander Aleinikoff. About half are children. "In this context, the engagement of the public worldwide through our long-standing partner, the IKEA Foundation, has never been more important. I greatly appreciate the efforts of IKEA co-workers and the support of the customers who participated in this global campaign so that we can make the lives of thousands of refugees better and brighter," Aleinikoff said. 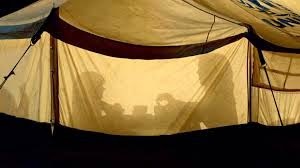 A lack of light in refugee camps after sunset can have a devastating effect on safety and security. The loss of daylight means that even simple activities like using the toilet, collecting water or returning to the shelter can become dangerous, particularly for women and girls. The campaign focuses on providing renewable energy solutions like solar-powered streetlights, solar-powered lanterns and fuel-efficient cooking stoves that make camps safer and more comfortable. Solar lanterns help children study after dark, improving results in school. Solar street lights enable people to have more community gatherings and social activities. Solar lanterns allow refugees to continue important income-generating activities, such as weaving or sewing, long after the sun goes down. Solar lanterns enable refugees to run their small shops and kiosks into the evening so they can earn a sustainable income. The IKEA Foundation has partnered with UNHCR since 2010, helping to provide shelter, care and education in refugee camps and surrounding communities. The Foundation has to date committed more than €125 million (AED486 million) in support to UNHCR. 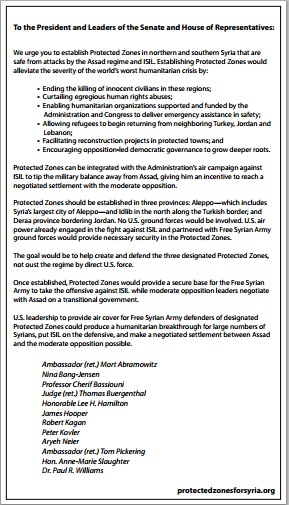 In a letter published in today’s Washington Post, 12 diplomats, former State Department officials, judges, professors, journalists and ambassadors appeal to U.S. President Barack Obama to establish Protected Zones in northern and southern Syria. But is “a negotiated settlement between [Syrian President Bashar] Assad and the moderate opposition” possible or indeed what the opposition is seeking? Encouraging opposition-led democratic governance to grow deeper roots. Protected Zones can be integrated with the Administration’s air campaign against ISIL to tip the military balance away from Assad, giving him an incentive to reach a negotiated settlement with the moderate opposition. Protected Zones should be established in three provinces: Aleppo -- which includes Syria’s largest city of Aleppo -- and Idlib in the north along the Turkish border; and Deraa province bordering Jordan. No U.S. ground forces would be involved. U.S. air power already engaged in the ­fight against ISIL and partnered with Free Syrian Army ground forces would provide necessary security in the Protected Zones. The goal would be to help create and defend the three designated Protected Zones, not oust the regime by direct U.S. force. Once established, Protected Zones would provide a secure base for the Free Syrian Army to take the offensive against ISIL while moderate opposition leaders negotiate with Assad on a transitional government. U.S. leadership to provide air cover for Free Syrian Army defenders of designated Protected Zones could produce a humanitarian breakthrough for large numbers of Syrians, put ISIL on the defensive, and make a negotiated settlement between Assad and the moderate opposition possible. “We don’t know whether Israel’s detention of the Palestinian lawmaker Khalida Jarrar has anything to do with her passionate advocacy for prisoners’ rights. It could be her membership on a government-appointed committee mandated to follow up Palestine’s recent accession to the International Criminal Court (ICC). Israel is not saying. But one thing is quite clear: her case is rife with due process violations,” writes Bill Van Esveld in Human Rights Watch’s Dispatches on Thursday, Apri 9. 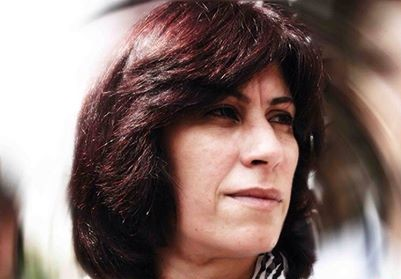 Israeli forces raided Jarrar’s West Bank home in Ramallah around 1 a.m. on April 2 and arrested her. They shuttled her to an Israeli settlement, then to two military bases, interrogating her at the second all morning, before transferring her to a prison inside Israel, her lawyers said. On April 5, the Israeli military commander of the West Bank ordered her administrative detention for six months. “They attacked our house at about 1 a.m. They broke the door… They isolated me in another room and stayed in my house for about an hour. Finally they kidnapped my wife, Khalida,” her husband Ghassan Jarrar said. Under Israeli law, the military can detain any Palestinian without charge or trial if it can convince a military judge that the evidence provides “reasonable grounds to believe” that the person poses a “danger to security,” Van Esveld writes. “The military is under no obligation to share that evidence with the person being detained. The military judge can approve a military order detaining him or her for up to six months; the detention can be indefinitely renewed. The Fourth Geneva Convention on military occupations allows for temporary detention of civilians without charge “if necessary, for imperative reasons of security.” That’s an easy claim to make when the 400-plus Palestinian administrative detainees are provided no fair opportunity to contest the evidence against them, Van Esveld notes. Jarrar -- a 52-year-old member of the Palestinian parliament -- is a member of the Popular Front for the Liberation of Palestine (PFLP), a political party that Israel has deemed an “illegal terrorist organization.” The party has an armed wing that has attacked Israeli civilians but the Israeli military hasn’t charged her with any link to such attacks. During her interrogation on April 2, Israeli officials played three videos of her making speeches and questioned her about her political statements, Jarrar later told her lawyer. Jarrar is no stranger to Israeli harassment. Israel has banned her from traveling abroad since 1998, although it allowed her to receive medical treatment in Jordan in 2010. Last August, the military issued a “supervision order” requiring her to leave her home and stay in Jericho for six months on the basis that she posed a security threat due to her alleged “incitement and involvement in terror.” She ignored the order and set up a protest tent outside the Palestinian parliament in Ramallah; the military later shortened her expulsion to 30 days and took no further action to enforce it. Her position as a member of the team that oversaw the Palestinian Authority becoming a member of the ICC last week led to suspicion that the arrest may be a punishment. Israel has been fiercely opposed to Palestine joining the ICC. “This is how Israel seeks to deter every Palestinian public activist -- not to mention one involved with advancing the processes in the ICC – from realizing his or her rights,” the Israeli newspaper Haaretz said in an editorial. 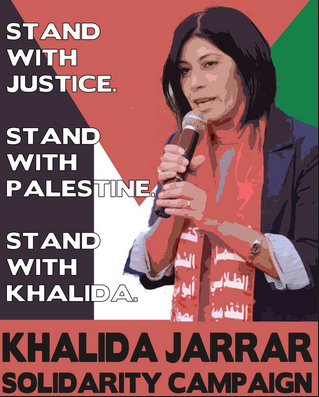 “If Jarrar broke the law, Israel must put her on trial and prove she committed a crime. If, on the other hand, the reason for her detention is revenge, she must be released immediately,” the paper added. Jarrar has been a human rights activist for many years. She is active in support of Palestinian prisoners and she served as the director of Adameer Prisoners' Support and Human Rights Association in Ramallah from 1993 to 2005 and remains a board member. She has also previously worked with UNRWA and has been prominently active in working with Palestinian women and advocating for women's rights. In 1989, Jarra was arrested by the IDF for taking part of a protest on International Women’s Day. Since 1998 Jarrar has been banned from travelling outside of the Occupied Palestinian Territories. She has two children. In 2005 Israel refused to allow her to leave the country to attend a human rights conference in Ireland. 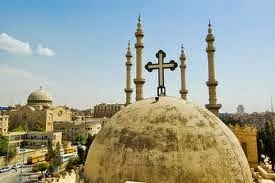 It seems so appropriate to speak of diversity and freedom of religion in Lebanon in this Holy Week, leading up to Easter Sunday. There is nowhere else I have seen practices as it is during Passion week. So it is with great interest that I read, and want to share, the preliminary report by United Nations Special Rapporteur Heiner Bielefeldt on freedom of religion or belief in Lebanon. On Thursday (April 2) he praised the country’s unique tradition of religious diversity, in particular in the Middle East region, and urged the Lebanese people to protect and preserve it. “Diversity as well as freedom of religion or belief must be preserved and further developed in order to build resilience against the spiraling religious extremism in the Middle East region,” Bielefeldt said at the end of an official visit to the country. “In face of the challenging time, Lebanon could be the ray of hope in the region and beyond for as long as it preserves and promotes its legacy of religious diversity,” he noted. Bielefeldt (Germany) assumed his mandate as Special Rapporteur on freedom of religion or belief in August 2010. He is Professor of Human Rights and Human Rights Politics at the University of Erlangen-Nürnberg. From 2003 to 2009, he was Director of Germany’s National Human Rights Institution. The human rights expert emphasized that people in Lebanon have learned the importance of coexisting even under precarious conditions. In his view, other enabling factors include active interreligious dialogues or cooperation and Lebanese citizenship. “Religious diversity is a visible and audible reality, as Churches and Mosques often stand in close vicinity and the ringing of bells at times blends with the Muslim prayer call. Some Lebanese openly declare themselves as agnostics or atheists and express critical views on religion in general, which is mostly appreciated as something quite natural in an open society. 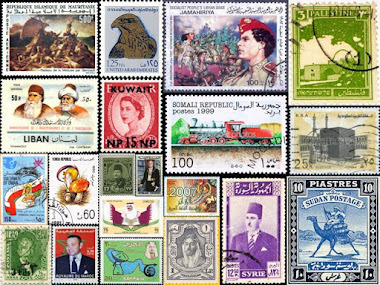 “Lebanon’s pluralistic heritage represents a counter-point to aggressive agendas of sectarian homogenization, which haunt some of its neighboring countries. Over the centuries a culture of interreligious coexistence has emerged, which today helps to build resilience against extremist interpretations of religious traditions. Due to mixed marriages, many families comprise persons of different religious orientations. Many people live, learn and work together across confessional lines, a situation which quite naturally fosters the discovery of common interests…” Bielefeldt wrote in his preliminary statement. “Even though equal power sharing on one hand maintains stable relationship among religious denominations, it may on the other hand weaken the civil structure and reinforce political fragmentation,” Bielefeldt further explained. He noted that allowing civil marriage in Lebanon will be a test case in further strengthening diversity. “Mixed marriages are a reality in Lebanon and the absence of a civil marriage law may create problematic situations from the perspective of freedom of religion or belief and exacerbate discrimination against women,” he said. Bielefeldt concludes: “In discussions on how to preserve and further develop religious diversity in the face of external threats and internal challenges I have experienced a surprising readiness for reforms… Disentangling the tightly knit web of religious loyalties, political affiliations, social positions and societal opportunities may thus enhance the prospects of common citizenship while at the same time ensuring that the inner attractiveness and persuasiveness of religious messages can unfold without getting mixed with non-religious incentives. Similarly, I have sensed much willingness to introduce optional civil marriage in Lebanon, in order to accommodate the realities of modern life in a more honest and open manner. Also in discussions with religious leaders and dignitaries I rarely came across a wholehearted and clear defense of the status quo. 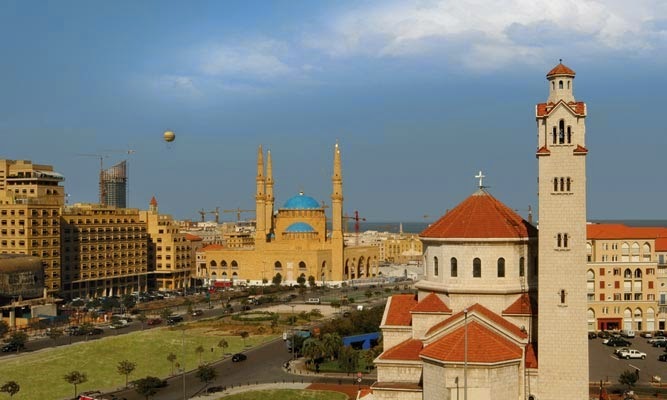 Fears that the option of contracting civil marriages in Lebanon would erode the existing religious diversity would indeed betray a lack of confidence in the inner persuasiveness of religious traditions. During this 11-day mission to Lebanon, Bielefeldt met with various government officials, representatives of religious or belief communities, including the refugees, civil society organizations and the UN. Bielefeldt’s full end-of-mission statement can be read here. The final official report will be presented to the 31st session of the Human Rights Council in March 2016. The Pew Research Center surveyed thousands of people across 32 emerging and developing nations about their technology use and how the rising influence of the internet affects their daily lives. But, Jacob Poushter writes, beyond the larger findings, Pew found some notable data points about specific countries that might have been lost in the fray. 1 Almost no one in Nigeria, Ghana, Bangladesh and Uganda owns a landline telephone. Many people worldwide are skipping the fixed telephone line that many Americans grew up with, and this fact is most apparent in many emerging and developing nations. 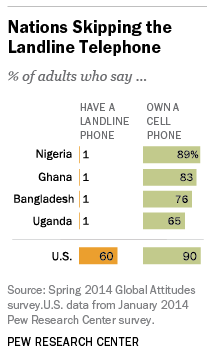 Only 1% of the population in Nigeria, Ghana, Bangladesh and Uganda say they own a working landline telephone in their household, while 89% in Nigeria, 83% in Ghana, 76% in Bangladesh and 65% in Uganda own cell phones. This compares with 60% landline penetration in the U.S.
2 Chinese internet users love to shop. About half of online Chinese (52%) have used the internet to buy products in the past 12 months. Given the size of the online Chinese marketplace, this goes a long way in explaining the meteoric rise of commerce giants such as Alibaba and Baidu. 3 Filipinos love social networking. Among adult internet users in the Philippines, 93% say that they use social networking sites, such as Facebook and Twitter. This is the highest such percentage across the emerging and developing countries surveyed and greater than the 74% of internet users in the U.S. who use social networking sites. Roughly seven-in-ten of those Filipino social networkers use these platforms to share views about music and movies, while half talk about sports. 4 Indians and Bangladeshis use the internet for job hunting. Very few people in India and Bangladesh use the internet -- only 20% and 11% respectively. But among those who do, job searching is a popular activity. Majorities of internet users in Bangladesh (62%) and India (55%) say they have looked for a job online in the past year, the highest rates among the 31 countries surveyed that have enough internet users to analyze. 5 Young Thais are internet enthusiasts. In every country we polled, younger people ages 18 to 34 are substantially more likely to say they use the internet than those who are older. Especially large differences occur in Asia, and particularly in Thailand, where 83% of 18- to 34-year-olds are online, but only 27% of those 35 and older are. 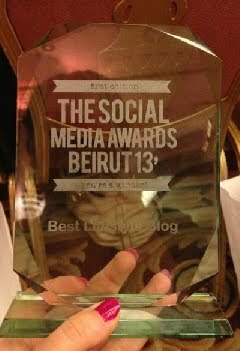 6 Politics is a big social media topic in Lebanon. Among Lebanese who use social networks, an astounding three-quarters say they use the platform for discussing politics. Similar levels of political participation occur among social network users in Egypt (66%) and Jordan (63%). Across all the countries surveyed with sufficient numbers, only a median of 34% say they talk politics using social media, including 16% of Filipino and Vietnamese social networkers and 19% of Indonesians. 7 Ukrainians get their political news online. Overall, a median of 54% of internet users across emerging and developing countries surveyed use the internet to get political news and information. But in Ukraine that figure is much higher: Eight-in-ten internet users do so. The survey was fielded after the ousting of President Viktor Yanukovych from office in early 2014 and toward the beginning of the ongoing conflict with Russian-backed rebels in eastern Ukraine, meaning many Ukrainians followed those news events online. However, only 53% of Ukrainians have access to the internet. 8 Nearly eight-in-ten Russians own a computer. Due to the rise of smartphones, many people in emerging and developing nations access the internet from a device other than a personal computer. But about eight-in-ten Americans (80%) and Russians (78%) have a working computer in their household. In contrast, only 3% in Uganda say they have a computer in their home. 9 Venezuelans like taking pictures and videos with their phones. Overall, Latin Americans (just like in the U.S.) are quite keen on capturing the world around them, with more than six-in-ten mobile owners in Chile, Mexico, Argentina, Brazil and Nicaragua saying they have taken videos or pictures with their phones in the past year. In Venezuela, this is particularly common: Three-quarters of cell phone owners (who constitute 88% of the adult population) use their device to take pictures or video. 10 Many Poles access medical information online, especially women. More than six-in-ten internet users in Poland (64%) say they have gotten health information online in the past 12 months. This includes 72% of female internet users, but only 56% of male users. Similar gender gaps are found in the U.S., and also in Russia and Ukraine.